It’s already one of the most affordable and desirable family sports cars on sale, and now ŠKODA’s mighty Octavia vRS is even more compelling thanks to the introduction of a UK special edition model; the Octavia vRS Challenge. The new model features up to £4,535 worth of extra equipment for only £2,460 compared to the standard vRS model. 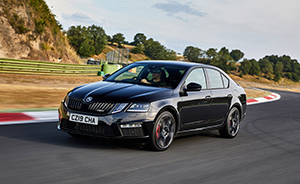 Positioned above the standard vRS and offered with the brand’s acclaimed 2.0 TSI 245PS engine, the Octavia vRS Challenge combines impressive performance with high equipment levels and an ultra-practical cabin. Available in both hatch and estate forms, the Octavia vRS Challenge is priced from £30,085 OTR (hatch) and £31,285 (estate) and is available to order from ŠKODA retailers from today. The fitment of an electronically regulated VAQ limited-slip differential allows drivers to fully exploit the car’s performance - even in challenging conditions. The VAQ limited-slip differential was originally developed for motorsport and works with an electronically regulated multi-plate clutch located between the differential and the powered axle on the right-hand side. When needed, 100 per cent of the power can be directed to one front wheel. When cornering, the differential transfers an increased amount of engine power to the outer front wheel (wheel with the most grip) as required.